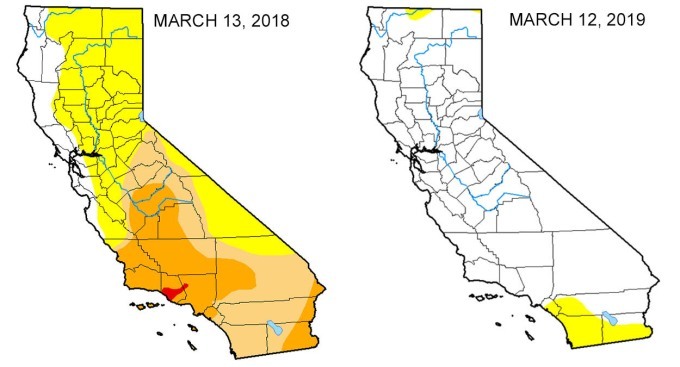 This map shows drought conditions in California in March 2018 and March 2019. The red area signifies extreme drought; orange indicates severe drought; tan areas were in moderate drought; and yellow indicates abnormally dry. Storms continued to pile on snowpack and fill California's water reservoirs over the past week, pulling even more of the state out of drought. Last week, a small sliver of extreme Northern California was the only part of the state in moderate drought. 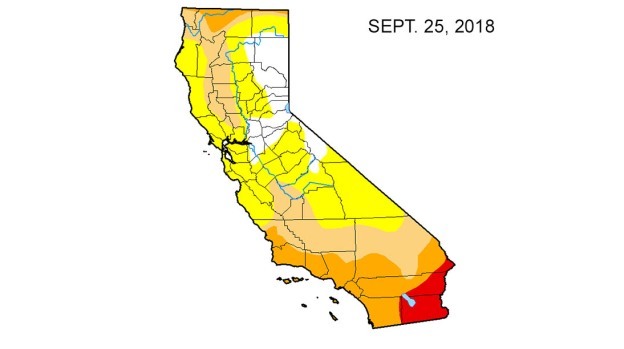 That area and a swath of California near its border with Mexico were listed as abnormally dry, a less severe condition than drought, in this week's U.S. Drought Monitor report. That means California is free of drought for the first time since Dec. 20, 2011, according to the National Drought Mitigation Center. This map shows drought conditions at the start of the water year, the wettest months of the year, in September 2018 in California. One year ago, nearly 50 percent of California was in moderate to extreme drought. Part of Ventura County and a northwest Los Angeles County were in the extreme drought category -- the second-most severe category in the drought monitor's ranking system -- at this time last year. Just three months ago, 75 percent of the state was in moderate to extreme drought. 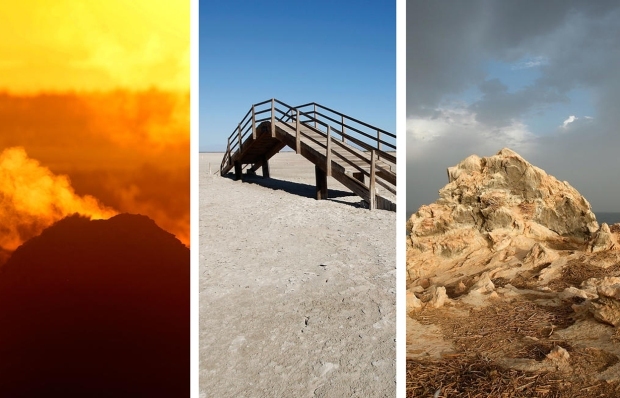 Even the Salton Sea area, a southeastern California region that has consistently been among the driest parts of the state, returned to what the Monitor described as normal conditions. "The rest of the region in Southern California is still abnormally dry due to very dry previous years," the weekly report noted. "Reservoirs in San Diego County are only at 65 percent capacity." Big Bear Lake in the mountains east of Los Angeles was down 18 feet in early March, but it's expected to continue to rise, according to the report. Also in Southern California, Lake Piru in Ventura County is at 74 precent capacity, Cachuma Reservoir in Santa Barbara County is at 73 percent capacity, and Lake Casitas near Ventura is up to 43 percent capacity. One of the most encouraging signs is the giant pillow of snow covering the Sierra Nevada Mountains. A manual survey of snowpack at Phillips Station late last month indicated a snow depth of 113 inches and a snow water equivalent of 43.5 inches. That's double what was recorded a month before at the same location. Statewide, the Sierra snowpack was at 153 percent of average for the late February survey. 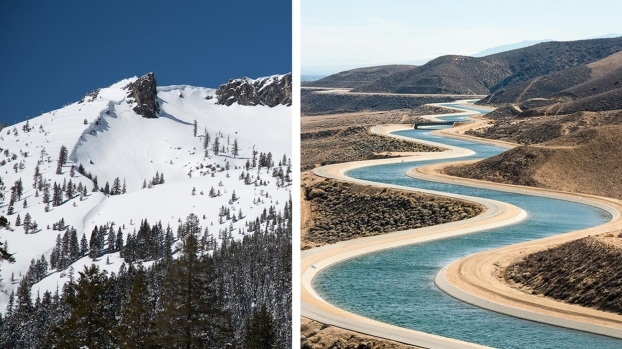 The snowpack is a critical part of California's water supply because that snow melts in spring and runs off into the state's water system. “As the climate continues to warm, atmospheric rivers, responsible for many of the heaviest extremes, will carry more moisture and extreme precipitation may increase,” the assessment says. Atmospheric rivers, bands of moisture in the sky over the Pacific that fuel colossal rain-making storms, have contributed to some of California's wettest winters. Storms draw moisture from the rivers as they move toward California, sometimes unleashing days of steady rain on the West Coast. But warming air can also exacerbate periods of drought. One group of researchers last year dubbed the change from extreme dry to wet conditions in the state as “precipitation whiplash events,” Quartz reported. In 2014, then-Gov. Jerry Brown declared a drought emergency for California, ordering prohibitions on wasteful water use like hosing off driveways and sidewalks, and watering lawns within days of a rainstorm, after a several dry years. That emergency order was lifted for most of the state in 2017 after a historically wet winter.